Whether you are a homeowner or apartment renter there are a lot of tasks that you can take care of on your own. Accomplishing those minor repairs will give you a great sense of pride in your living space. You might even want to throw party to show off the faucet you stop from leaking! However, there are some jobs where help from the outside is required. That is certainly true when it comes to hauling away unwanted junk. The best approach for that task is to bring in the pros from Junk King Jacksonville. This is a company that has been in this line of work for over 12 years and they know how to get the job done fast and affordable. Junk King Jacksonville’s pricing policies are based on volume. That would be the volume of space in the back of their truck that will be taken up by your junk. The crews have a lot of experience with packing up their trucks. Their goal is always to get as much into as little space as possible. That allows them to make several appointments during the day. It also means you’ll be getting a terrific price on your junk removal. The range flows from one third, one half, one quarter or the whole truck bed. You’ll know exactly what this price is before the work begins. It’s a good thing to know that you’ll never be charged by the pound with Junk King. That means you shouldn’t hesitate with getting rid of heavy things like a futon or sofa. Even tossing out an old refrigerator is easy when you’ve got Junk King Jacksonville on the job. With regard to timing, Junk King Jacksonville knows how important your day off is and they don’t want to keep you waiting. Typically, they will call you when there around 15 minutes out from the scheduled appointment time. Once they show up and the price is been locked down they move very swiftly. 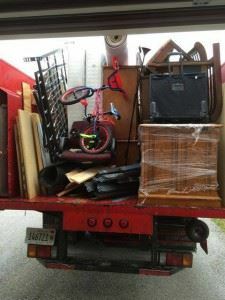 You’ll be pleasantly surprised at how quickly they can clear out a garage or basement of all kinds of unwanted clutter. When you’re ready to get rid of your junk, Junk King Jacksonville will be ready to jump in. This entry was posted in Jacksonville junk removal and tagged clutter, Junk King, junk removal, rubbish on August 31, 2017 by Junk King. Last updated August 31, 2017 .